There was Tampa and Dunedin in the northwest. There was Port Charlotte down the coast. There was West Palm Beach and Jupiter on the Atlantic side. And it all started at Walt Disney World's Wide World of Sports for one last time before North Port becomes part of the equation in 2020. The only things missing were Johnny Cash vocals. 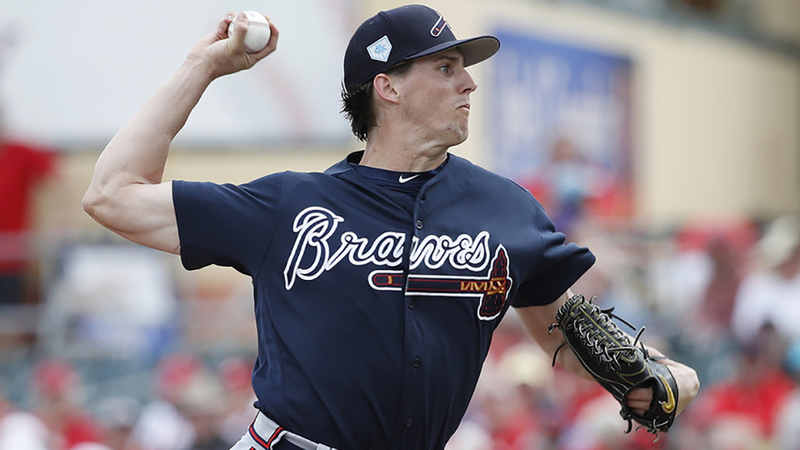 Braves: Kyle Wright/Touki Toussaint -- Atlanta had one opening in its rotation entering this spring, and now they should have two on account of Mike Foltynewicz's elbow soreness. I was in Lake Buena Vista on a day in which two of the Braves' top pitching prospects auditioned for the jobs and inched closer to winning roles in the process. Wright got the start and looked more impressive than his final line would indicate. He hit 100 mph on the stadium radar gun with his second pitch against the Pirates, sat 94-96 mph for much of the afternoon and got four of his five strikeouts on breaking pitches. He did allow two earned runs on four hits and a walk in three innings, but there was still buzz after the game that, after three scoreless starts to open the spring, he'd shown enough stuff to prove he can be a Major League starter right now. Wright, who enters the season as MLB.com's No. 30 overall prospect, was pleased after the game with the way his pitches -- and most importantly -- his control had improved, and the Braves seem to share in that excitement. Toussaint had the inside track on the No. 5 job even before Foltynewicz's health concerns, and after them, he should move into the No. 4 slot. From a results standpoint, he actually enjoyed the better day Monday, scattering two hits while striking out four over four scoreless innings. He was about 92-94 mph with his fastball, while his curveball continued to look plus-plus as he mowed down a prospect-heavy Pittsburgh lineup including Ke'Bryan Hayes, Travis Swaggerty, Kevin Newman and Will Craig. The biggest number might have been the zero in the walks column. Toussaint has consistently showed better control this spring whereas that skill had been a bugaboo for much of his early career. The No. 50 overall prospect has walked only two batters while fanning 17 in 14 innings this spring. As a result, he should waltz into the Atlanta rotation, and it could be difficult to knock him out if this continues, even when Foltynewicz and Mike Soroka get fully healthy. Blue Jays: Anthony Alford -- Toronto's No. 11 prospect needed a good spring coming off a 2018 season in which he batted .240/.312/.344 in 105 games at Triple-A Buffalo and had a much tougher go (2-for-19, nine strikeouts) in the Majors. He's had it, hitting four homers while producing a .978 OPS in 16 games. He didn't show that bat necessarily Tuesday during my trip to Dunedin -- the only time he reached base was when he was plunked -- but he did provide a reminder of his capabilities when his offense isn't there. Starting in right field, the former college football defensive back went to his left quickly and reached across his body to make a nice snag to rob Tommy Pham of extra bases. When healthy, Alford has the speed and athleticism to bring plenty of defensive value in any outfield spot, though he's unlikely to move Kevin Pillar off center. It's a big reason why Jays officials remain high on Alford, even after seeing him to struggle to stick in the Majors for a second straight season. Yankees: Josh Stowers -- New York might like Stowers a little more than the industry as demonstrated by the fact that Shed Long (the No. 12 prospect in the Seattle system) was flipped for him as part of the Sonny Gray trade. Stowers is the Yankees' No. 25 prospect, less than one year after the Mariners took him in the second round out of Louisville. He's got above-average speed and showed a solid approach overall with Class A Short Season Everett last summer, hitting .260/.380/.410 with five homers in 58 games. The only question was whether he'd ever hit for more power. He did in my look Wednesday against the Braves' Double-A squad, uncorking a homer to deep left at the Minor League complex in Tampa. New York might see a way to tap into some power with the 6-foot-1, 200-pound outfielder, and he'll need it if he's going to move off center and into left field eventually. On this day, he checked that box off. Rays: Wander Franco -- With Vladimir Guerrero Jr. out with an oblique injury, the Tampa Bay shortstop became the bat I was most excited to see -- and equally excited to see live up to expectations. The No. 13 overall prospect burst onto the scene by batting .351/.418/.587 at Rookie Advanced Princeton last season, and many expect he could be the game's top overall prospect should he carry even something close to those numbers over a full season. Playing for the Class A club against the Orioles on the backfields, the switch-hitter put on a bit of a clinic. Batting from the left side in his first at-bat, he hit a screaming liner that would have fallen in for a hit if it wasn't for a leaping Baltimore shortstop. Batting from the right side in his second time up, he intentionally slapped the ball the other way through the hole created at second base by a hit-and-run. He achieved this by staying down on the ball and guiding it toward the right side, not an easy feat for a low-level hitter. If he can keep up this type of hand-eye coordination and hard contact from both sides of the dish, he might not be a low-level hitter for long in 2019. Marlins: Jorge Guzman/Victor Victor Mesa -- Miami's system is based heavily around talent acquired in the past 18 months or so, and a few showed why there can be some excitement in the rebuild during intrasquad play. Guzman's fastball just sounds different with an audible zip in flight and the obvious pop in the catcher's mitt that sounded louder than any other pitch Saturday. While velocity wasn't available -- he's regularly hit triple-digits in the past -- the offering was effective in keeping fellow Marlins prospects off balance. Guzman snapped one bat in two and got several more weak ground balls off the fastball, earning praise from coaches when he departed after two innings. The off-speed still needs work, though. His slider and changeup offered little crispness and were only effective at providing a different look than the heavy and hard fastball. Upper-level batters could handle the heat a little better over multiple looks, and Guzman could be challenged at Double-A and above as a starter as a result. But it wasn't difficult to see that he could at least make a special reliever someday. Mesa is the midst of his first spring, and it hasn't exactly gone to plan. The No. 99 overall prospect signed for $5.25 million in the fall and just when he was about to show why he was worth that investment, he suffered a hamstring injury in a Grapefruit League game. On Saturday, he had returned to spring preparation by batting against live pitching only and not running. He simply headed back to the dugout after hitting a fair ball as a means of protecting the hamstring. So he did the most he could. He homered to left in his second at-bat -- the only long ball hit by any Marlins Minor Leaguer on that field that day. Mesa isn't expected to be a big-time slugger by any means, but if Miami wanted any indication that a hamstring injury won't hold him back long-term from carrying his multiple tools to the Minor League ranks, he provided such a relief Saturday. Nationals: James Bourque -- If Guzman is exciting for his reliever potential, Bourque is already fulfilling that role. After trying to make it as a starter, the 25-year-old right-hander moved to the bullpen last season with exciting results -- a 1.70 ERA, 1.06 WHIP and 76 strikeouts in 53 innings between Double-A Harrisburg and Class A Advanced Potomac. The Nationals' No. 18 prospect looks to have maintained that momentum this year, based on his outing Sunday against Mets Triple-A players. Hitters looked off balance against his plus fastball for much of the appearance, and his curveball got several swings-and-misses low in the zone. (He struck out Tim Tebow with a sharp bouncer.) Bourque's delivery has a lot of movement, and that has hurt his control in the past. The Nationals are still working with him on making that high-effort windup repeatable, but it's still hard to take the ball out of his hand in the best of times. Bourque is on the Nationals' 40-man roster, and some more K-heavy relief outings could propel him to the capital in short order. Mets: Pete Alonso/Desmond Lindsay/Ronny Mauricio -- Washington prospects were meant to be the focus Sunday in West Palm Beach, but the visiting Mets gave plenty of looks on the Major and Minor League sides. What else is there to say about Alonso that he hasn't already said -- and loudly -- with his own bat? The No. 51 overall prospect has gone deep four times this spring as he pushes to win New York's Opening Day first-base job, and his latest effort was yet another sign of his true strength. The right-handed slugger reached over the plate down and across the plate to push a two-run shot the opposite way to right on a 2-2 pitch from right-hander Henderson Alvarez. It looked like Alonso was just punching to make contact, but his plus power carried the ball out to continue his strong spring. After the game, Mets manager Mickey Callaway said he couldn't make a case against having Alonso on the 25-man roster to open the season. Now we wait to see what the New York brass says via their transactions in the days to come. Over on the backfields, No. 3 prospect Ronny Mauricio caused some trouble with a sharp single up the middle followed by a stolen base. The 17-year-old shortstop isn't known for his speed -- having only stolen two bags with two short-season affiliates in 2018 -- but he took the bag easily Sunday. With good hit and power tools, he could fall in line with Amed Rosario and Andres Gimenez as the next exciting Mets shortstop to ascend toward Queens. In the same Double-A game, No. 11 prospect Desmond Lindsay showed what's he capable of when healthy by drilling a triple that reached the left-center wall on the fly. It's possible he could gone inside-the-park had the third-base coach given him the green light. The 2015 second-rounder has always shown plus speed, but leg and elbow issues kept him from playing more than 90 games in any of his four Minor League seasons to date. After a brief time in the Arizona Fall League -- in which he went yard three times in eight games -- Lindsay has shown his potential in bursts. Sunday's showing good be another burst, or it could be the start of realized potential. Oh yeah, and Tim Tebow homered.